"A quick and easy recipe for making delicious syrups for flavoring milk. A great alternative to those boring old chocolate or strawberry milk syrups. Make any flavour you like." In a saucepan over medium high heat, combine sugar and water. Cook, stirring, until mixture comes to a boil. Boil for 30 seconds to 1 minute. Remove from heat and allow to cool. Stir in drink mix powder. To serve: Stir 1 tablespoon syrup into 8 ounces milk, or to taste. 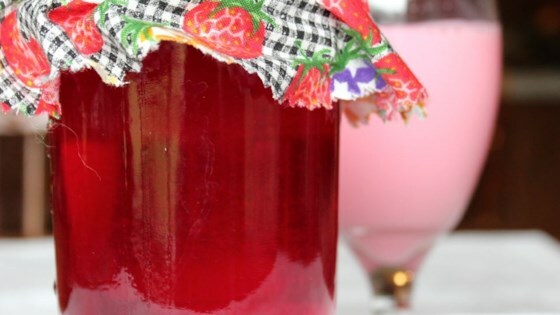 You can also mix this syrup with carbonated water for a fruit flavored soda. I've made this twice so far and it goes fast. My 2 1/2 year old son LOVES it. This is so much cheaper than buying the store bought syrups. I cut the sugar in half & used grape flavor kool-aid. Even I liked the flavor it added to the milk. Neat idea...thanks! this was a good idea. pretty good my toddler loves it.